ILive Boombox Bluetooth Speaker with CD Player and FM Radio (Black). The iLive Portable Bluetooth CD/Radio Boombox lets you take your music with you in style! Stream music from your device to this boombox for unrivaled control of your listening experience. This portable boombox features a digital FM radio and a top load disc player. Connect your mobile device wirelessly or utilize the audio line input to play music from non-Bluetooth equipped devices. Features include powerful built-in stereo speakers, digital volume control, programmable tracks, and handle for easy mobility. AC power: built-in AC power cable. DC battery power: requires 6 C batteries (not included). ILive products are specifically designed to enhance your digital devices including iPod, iPhone, iPad, Android, Blackberry, Mobile Phones, Tablets, Televisions, and Bluetooth Devices. Perfect for students or parents, iLive is the ideal choice for your music enjoyment needs. 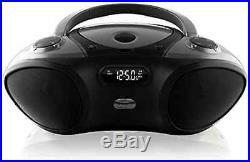 Portable boom box with CD player and radio; Supports Bluetooth v2.0. Take your music with you in style! Built-in AC power cable. We are not responsible for wrong or undeliverable address. 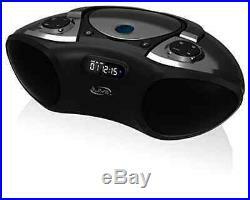 The item “Speaker Boom Box Portable Bluetooth FM Radio And CD Player Connects Wirelessly” is in sale since Saturday, June 11, 2016. This item is in the category “Music\Storage & Media Accessories”. The seller is “excellent15390″ and is located in Miami, Florida. This item can be shipped to United States, to Canada, to United Kingdom, DK, RO, SK, BG, CZ, FI, HU, LV, LT, MT, EE, to Australia, GR, PT, CY, SI, to Japan, to China, SE, KR, ID, to Taiwan, ZA, TH, to Belgium, to France, to Hong Kong, to Ireland, to Netherlands, PL, to Spain, to Italy, to Germany, to Austria, RU, IL, to Mexico, to New Zealand, PH, SG, to Switzerland, NO, SA, UA, AE, QA, KW, BH, HR, MY, BR, CL, CO, CR, DO, PA, TT, GT, SV, HN, JM.